IK Multimedia was one of the first in plugins and the first in mobile recording. They understood that smartphones and tablets are the next medium for recording. The iRig pre was one of the firsts and now it’s available worldwide. October 19, 2017 – IK Multimedia is proud to announce that iRig Pre HD is now available worldwide. The new iRig Pre HD is a high-definition, ultra-compact digital interface for microphones with an onboard Class A studio-quality preamplifier designed to deliver top notch audio performance with iPhone®, iPad®, Mac® and PC. It offers the ability to record anytime and anywhere using any kind of professional microphone with a XLR connector, including gain-hungry models and those requiring phantom power. Featuring an integrated 1/8″ headphone output for real-time direct audio monitoring, high-quality internal converters, LED indicators and a suite of professional audio apps, iRig Pre HD is the most comprehensive, portable digital microphone interface for professional applications on the market. Equally at home in the studio or in the field, iRig Pre HD is a versatile performer in virtually every professional context. Musicians, singers, journalists, podcasters, YouTubers, videographers and field sound recordists now have a powerful, elegant and ultra-compact tool allowing them to seamlessly integrate their favorite XLR microphones into their traveling setups. iRig Pre HD makes it incredibly easy to achieve superior sounding recordings anywhere and anytime by plugging in dynamic, condenser or ribbon microphones and recording directly on a device with astounding quality. iRig Pre HD features an integrated, high quality Class A microphone preamplifier with full-flat frequency response from 20Hz to 20kHz (+/- 1.5dB) for faithful, crystal-clear recording of the sound sources being captured by the microphone, for acoustic instruments, spoken word, field sounds and more. Thanks to its high performance A/D converters, iRig Pre HD lets users record or monitor any sound with a resolution up to 24-bit/96kHz, for a true audiophile experience. Moreover, using the iRig Pre HD with the included AA batteries allows users to engage the +48V phantom power necessary to drive their favorite condenser microphones. iRig Pre HD features an onboard headphone output with dedicated volume control. In addition, the 1/8″ headphone out can be used as an auxiliary output to send out recorded sound to external devices like an amplifier, PA, or a mixer. Alternatively, it can simply be used to drive a set of quality headphones to enjoy high-resolution digital music on every device (even the latest iPhone), taking advantage of the pristine quality and full dynamics of the internal D/A converters. The direct monitor switch allows listening to the sound being recorded in real time. This means users can easily monitor themselves while recording a vocal take or listen to an interview guest in a noisy environment with no latency. With a simple flick of the switch, users can change to regular monitoring and check the playback or listen to other audio files. 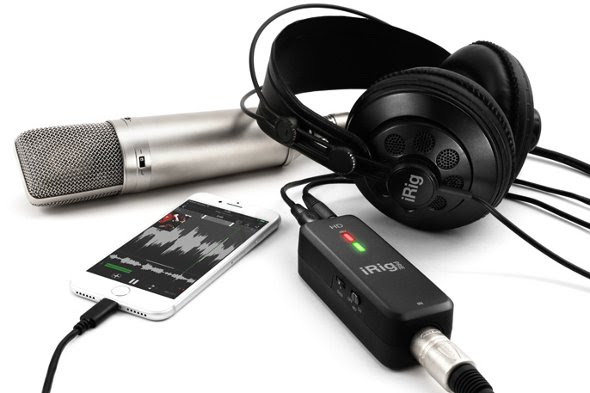 iRig Pre HD comes complete with a Lightning cable and USB cable for immediate connection to an iPhone, iPad, Mac or PC; 2 AA batteries and a velcro strip for securing it to a mic stand or other supports while in use. iRig Pre HD includes IK’s renowned Mic Room, the creative application for Mac/PC and iOS app that lets users record with the same character and sound modeled from some of the greatest microphones ever manufactured. iPad and iPhone users will also enjoy the included versions of the Mic Pack for VocaLive, that adds a collection of virtual microphone models to the real-time vocal effects processing and multitrack recorder app and the Pro Bundle for iRig Recorder, which adds essential processing like equalization and compression to the pro-audio recording and editing app with video. As is the case with the vast majority of IK Multimedia’s products, iRig Pre HD is “Made in Italy” in its fully owned state-of-the-art manufacturing facility that combines the highest quality processes together with a focus on world class craftsmanship. This goes together with IK’s social responsibility standards and eco-friendly programs, such as reducing power consumption by utilizing roof mounted solar panels to generate electricity.